So today my mind kept drifting to a project I wanted to try…I am dying to make rings from the silver clay, however firing up the kiln is not my favorite thing cause it takes hours! So, using Metal Clay Silver 650 I rolled out a strip, added some texture with a Ten Seconds Studio wheel, formed it around a piece of pvc pipe to dry (not joining, just overlapping), sanded the edges a bit then torch fired it and voila! A sizable silver band. I think it is just lovely. I’ve heard it isn’t as “strong” as if it were fired in the kiln…time will tell. It didn’t fall apart when I tumbled it….so I’m wearing it and loving it! Next, here is a shot of the bronzeclay I fired last week. I’m loving it and want to make more!! It sure feels interesting after working with pmc and metal clay silver. I’ve had a fascination with bezels lately. 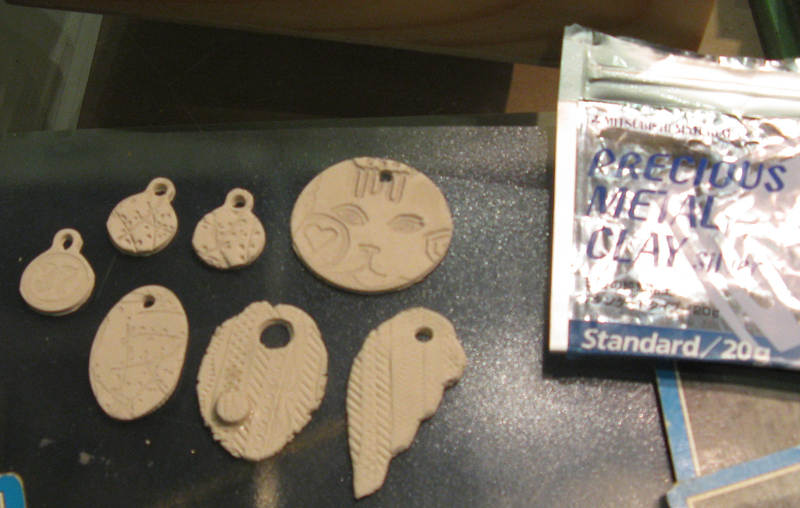 My plan is to fill them with resin…don’t know when or what I’ll put in the resin, but that is the plan…I had a couple of bails break off in the firing so I’m still working on that but for a first run I am 100% happy! Monday continues our National Craft Month with handmade seed paper. Have you wanted to learn how to turn your junk mail into beautiful handmade paper. Come for this mini workshop on Monday from 6:30-7:30 and do just that. Next week we’re making aluminum can jewelry! Tuesday is all about the Artist Trading Card background techniques from Bernie Berlin’s book. This week we’re using Magazine paper in many different ways. Join us for any of the Tuesday night sessions to learn techniques that translate into many forms of paper arts. Click here to register for Tuesday’s 6:30 pm session. Tuesday at 8 is Beeswax Collage: Using nothing but beeswax as the adhesive you will create a layered piece of art to hang or display. Click here to reigster. Wednesday from 11am-2pm we have a special guest instructor! Lance from Rusty Pickle will be here to teach a mini book class titled : All Things Sweet. Click here to register. Space is limited to 6 so register now to be sure you have a space or at least a kit if you can’t make it to class. Wednesday at 7pm we’re working with my favorite techniques creating acrylic backgrounds. Click here to register for this class full of painty goodness. This class is inspired by techniques used by Traci Bautista, Chrysti Hydeck & Kelly Kilmer. Saturday Night is the night to craft the night away during our Craft Rave. Bring a project or start one here. You’ll have full access to the studio tools and many supplies to inspire creativity. Click here to register. Sign up for any or many of these classes to support your local small business owner! Posted by Andrea in A Work Of Heart News, Notes from Andrea. Monday nights are our special “National Craft Month” series focusing on GREEN CRAFTING. Tonight (Monday 6:30pm) we are going to UPCYCLE colorful magazine pages into paper beads then fashion them into a cuff style bracelet. Click here to register. Tuesday Night 6:30pm – Artist Trading Cards Workshop – The techniques we’re covering this week is Leaf Resist, Inky Layers and Stenciling. Come and play with us. We had a blast last week and this week promises more of the same. Click here to register. 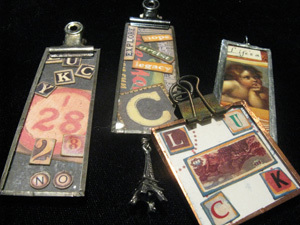 Tuesday Night 8pm – Soldering – Learn the basics to make your very own soldered pendants and charms. 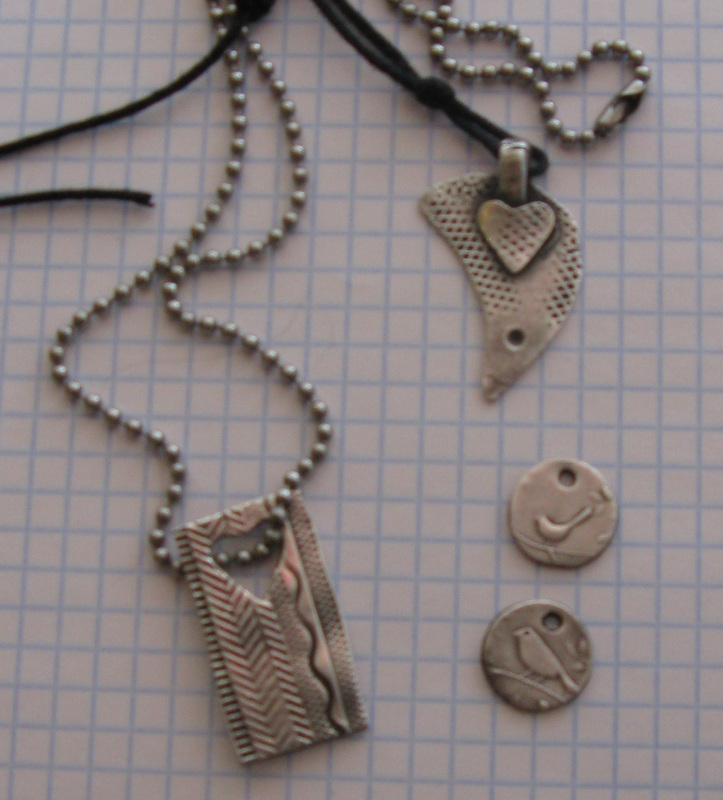 You will make one 1″x3″ pendant and one 1″x1″ charm with attached jump rings ready to wear. Bring your own imagery if you want, or use our studio stash. Click here to register. Wednesday 6:30pm – Altered Mirror – Cover 32 chipboard tiles with your choice of paper, ink & embossing powder, crackle paint, and bits & pieces for a beautifully customized mirror ready to hang in your home or give as a gift. Click here to register. Wednesday 8pm – Metal Sampler – Cover an 8″x8″ board with hand embossed art metal. Make a focal point with a grid of 9…hearts…flowers…stars….you decide the shape and color. Click here to register. Hope to see you at one or more of these times. Happy Crafting!! Feb 10th (Tuesday at 6:30) is Metal Effects: Do you love the look of the embossed metal projects we’ve been working on? Come in and Make a Heart Sampler using 10 Seconds Studio Metal, tools and plates. The fee is $15 for this 90 minute workshop. Feb 11th (Wednesday at 7pm) Alphabet Behind Glass: This collage is a substantial piece you can use as a wall hanging or as a tray. Each tile is embellished with 3 letters of the alphabet. Your complete project will include many techniques using the finest of art mediums and craft supplies. The fee is $55 for the 3 hour workshop and includes all materials. Feb 12th (Thursday at 6:30pm) Collage Unleashed: Using painted papers as our collage fodder, you will create Traci Bautista style collage following techniques found in her book Collage Unleashed. The fee is $25 for this 90 minute workshop and includes all materials and instruction. Feb 15th (Sunday at 12:30pm) Create Your Best Year: Julie Valentine, Life Coach, will explore the power and magic of vision boards and idea journaling to support you in creating your best year! A vision board is a tool that captures your vision for your life through color, images and words. The fee for this 2 hour workshop is $24 and includes all materials and instruction. Posted by Andrea in A Work Of Heart News, Classes & Craft Crave, Scrap Lovers at A Work of Heart. Thankful? I am so incredibly thankful and blessed to have the best business partner in the whole world, the most supportive family ever and the most creative and inspiring community here. Now, on to the business at hand. SOLDERING: (Tues Dec 2nd)Add the special silver metal finish to mini glass slides. Learn this technique and you will be able to MAKE! dozens of gifts from tiny bits of beautiful paper. Imagine the customizing possibilities. It all starts with one incredibly simple technique. Join us Tuesday night at 7pm to learn the basics and get certified to use the soldering equipment anytime you want to in the studio. PAINTED BACKGROUNDS: (Wed Dec 3rd) Having Traci Bautista here was an inspiring experience. I just can’t get enough painted paper backgrounds. 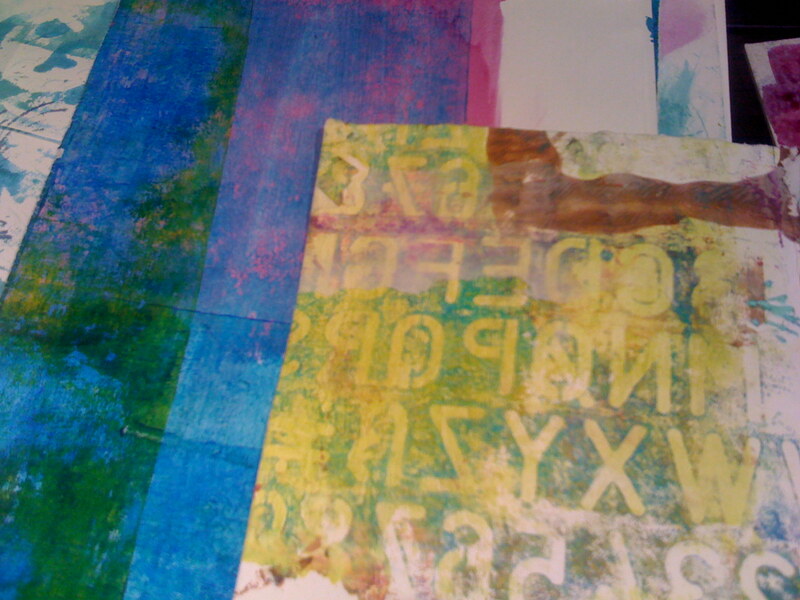 This evening will be a self-indulgent night of adding texture through dyeing paper towels and scraping paint. If you are even a little bit curious plan come in and check out what we’re up to. Wednesday night at 7pm we’ll each have our own table to spread out on. I’ll have a dip dye station set up and all the paper towels you need. I’ll even have gloves for those worried about their manicure. There is still a couple of spaces. It is an incredible value at $75 you get an entire weekend of crafting/scrapbooking time. The goody bag that comes with your registration is worth well over $75 itself. PLUS we are having a silent auction to raise money for the Second Harvest Food Bank. Posted by Andrea in Scrap Lovers at A Work of Heart. It was such a refreshing time last night. Here are our pieces drying. Here is a picture of our friend’s work drying and ready to fire.